This may surprise some who read this but, God's purpose isn't to make us happy as some try to say...in other words the idea that "God just wants you to be happy" isn't true plus...happiness is subjective. What makes one person happy isn't the same for the next person. Now joy on the other hand isn't subjective as joy is a gift from God and a fruit of The Spirit. Let me ask you, What if part of that joy He wants us to have is experienced through friendships? First and foremost a growing relationship and friendship with Him followed by a friendship with others? We see great friendships throughout the Bible like the friendship David and Jonathan had as they were as close as brothers. As well as other examples of those who valued friendships and who were great friends. There are a lot of lonely people in this world who don't take the risk to try be a friend and be friend-worthy...and knowing the joy we have as followers of Christ...we have no excuse for being lonely! 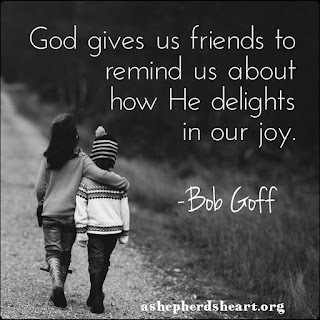 I pray that you and I would invest in the gift of friendship and get out of our own heads, comforts zones and circumstances and have God's wisdom to know who we should be friends with. No matter who you are, if you have true friends don't take them for granted as they are a gift from God and joy can be experienced through through this gift! I have been blessed with friends all over the world and I love meeting people and learning their story! It truly saddens me when I hear people say they "hate" people. There's definitely an absence of grace in statements like that.